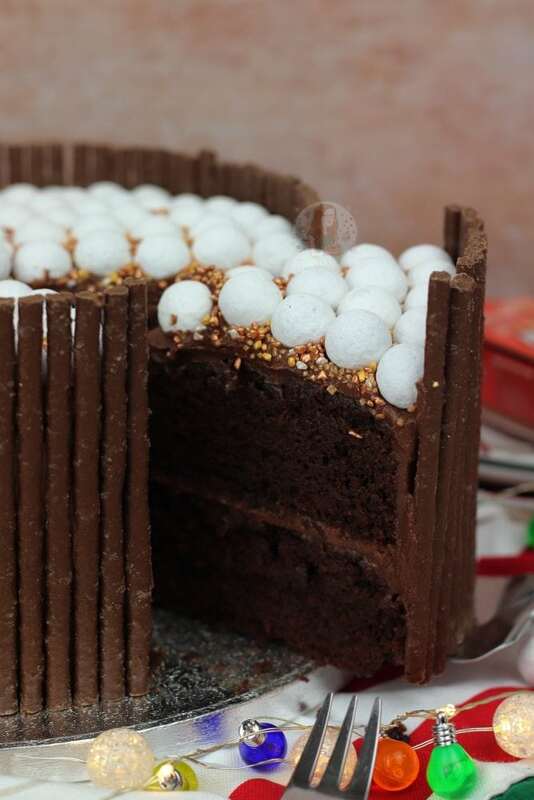 A Rich, Gooey and Delicious Christmas Chocolate Cake with Gingerbread Matchmakers, and all the Christmas sweets! 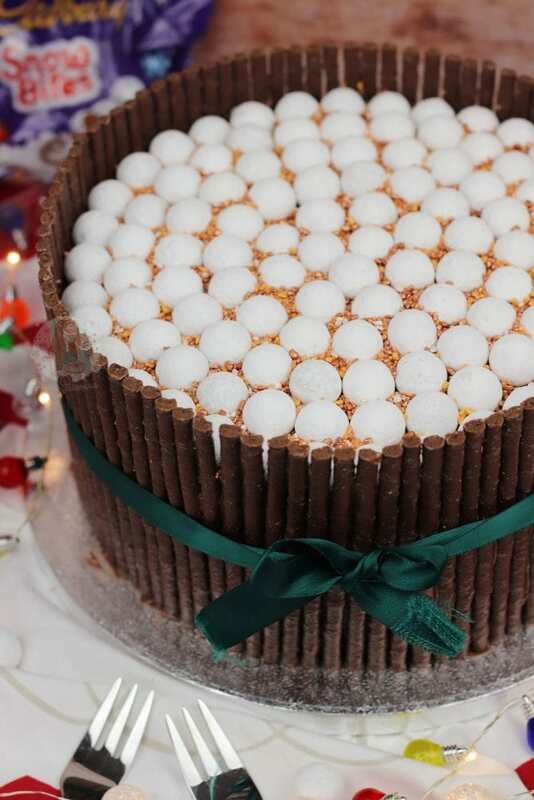 Oh, heyyyyy Christmas showstopper that you will all want to devour and bake just like I did… seriously though, oh my actual days. 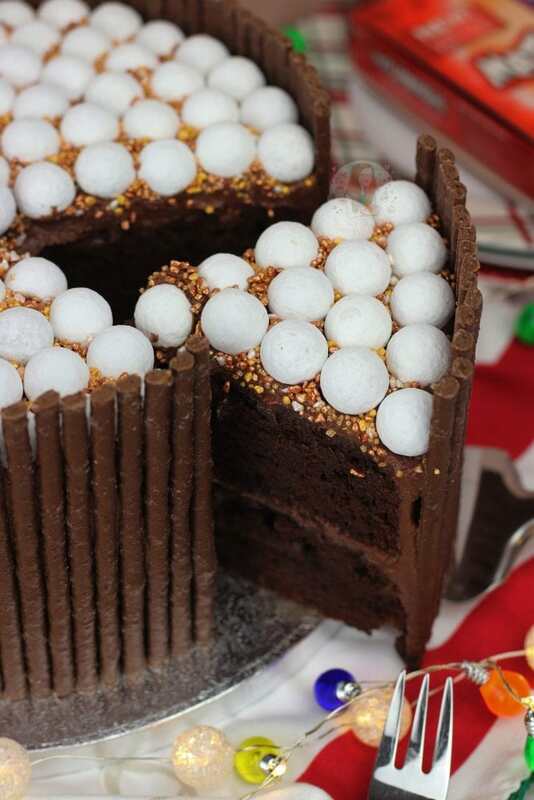 Something sweet, gooey, chocolatey and gloriously spectacular for the Christmas season?! Yes, please! 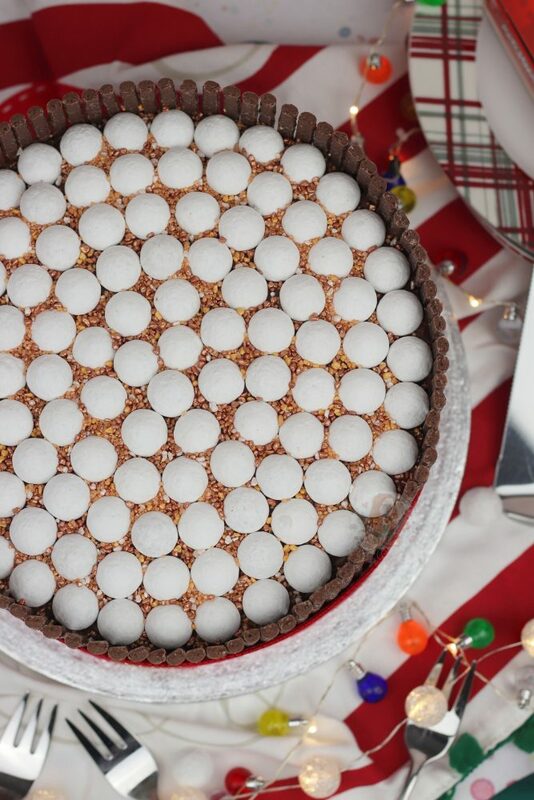 Whether you bake it and devour it before or after Christmas is up to you. This beauty is essentially a carbon copy of my Easter Chocolate Cake, but I just couldn’t resist. 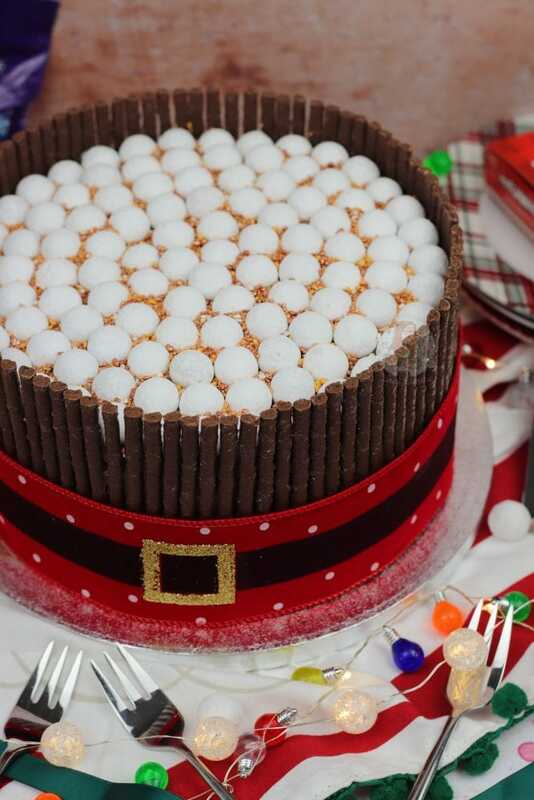 Once I had found the Gingerbread Matchmakers in Tesco, I desperately wanted to do a festive version of the cake, and I just knew you guys would love it all as well! 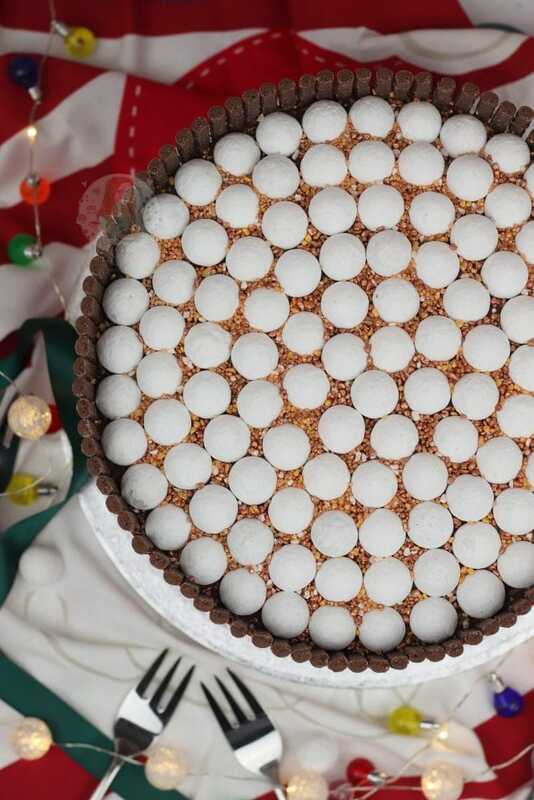 You can use any flavour Matchmakers, but the gingerbread ones were too good to not use! 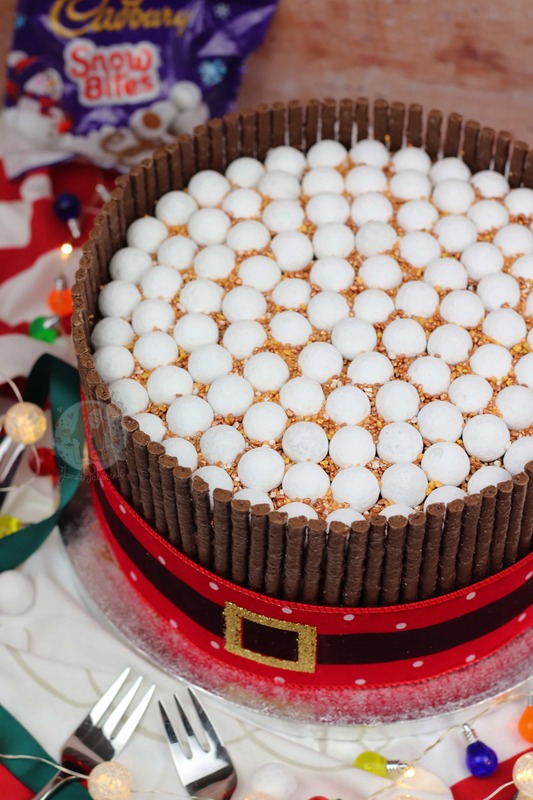 I used the Cadbury’s snowbites on top because they look like little snowy bundles of yum, obviously, but you have to use quiiiite a few packets to actually fill the top of the cake. You can use anything you really want to use, such as M&Ms, or anything else that’s reasonably round and not too large. 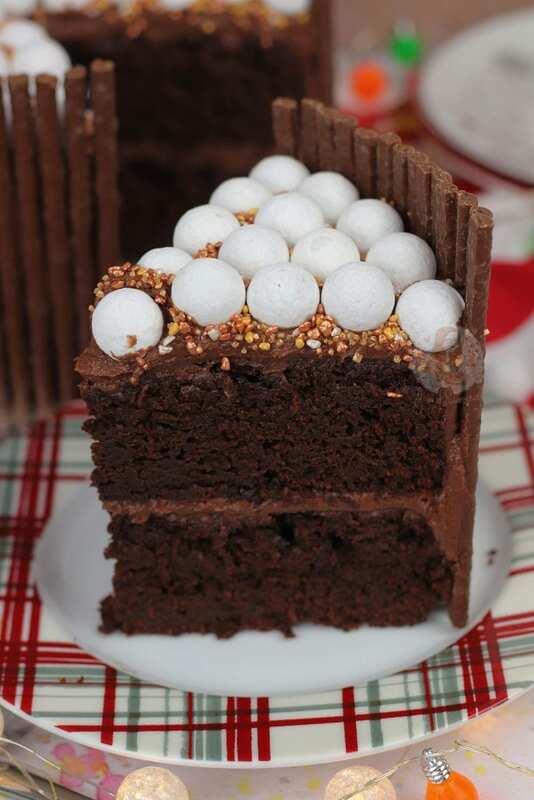 I like how uniform all the snowbites look next to each other, like how the Mini Eggs did on my Easter Chocolate Cake. This sort of recipe is designed to be extremely indulgent, and incredibly rich, so you only need a smaller slice. You can just use the actual chocolate cake and skip the rest of it, as its the same recipe from my Chocolate Fudge Cake post. The frosting is also the same, which if I can say so myself is the BEST chocolate frosting ever. The thing that makes the frosting so extra special is the evaporated milk that is mixed in. Without it, it’s just a regular chocolate buttercream frosting, but with it… it tastes insane. Genuinely, I never understood before I made the frosting how it could be so delicious, but my god it was. It’s the sort of frosting you’d want to sit and eat with a spoon. Maybe dip in a biscuit or two. I use a festive ribbon to wrap around the cake to seal it all in, and it also helps keep it together. When you slather the frosting on the side, you need enough to basically ‘smush’ the matchmakers into the sides of the cake without them falling off. Not so much it all squidges out and goes everywhere but enough to make sure that they stay. However, the ribbon definitely helps. Also, it looks damn pretty! I often get comments saying ‘can I just use condensed milk’ and they are actually very different things, so I’d recommend sticking with the evaporated milk. Also, the evaporated milk tends to come in smaller tins as well so there isn’t much leftover at all! 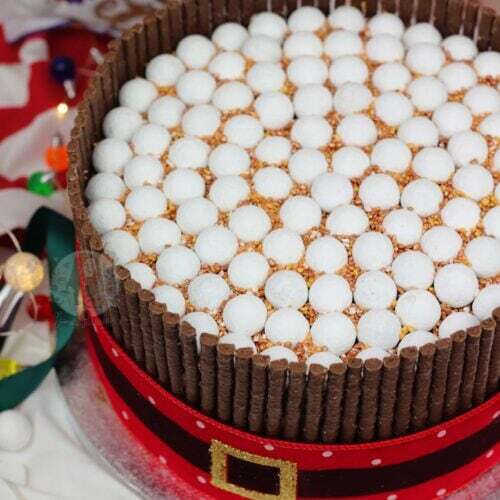 A Rich, Gooey and Delicious Christmas Chocolate Cake with Gingerbread Matchmakers and all the Christmas Sweets! Pour the mixture into the two tins and bake in the oven for 35-40 minutes (can take a little longer in some ovens) once baked leave to cool in the tin for 10-15 minutes and cool on a wire rack for a softer cake. Add the matchmakers around the edge next to each other. However, you have to do it quite quickly so that the frosting is basically the glue! I used the Gingerbread flavour, and I used just over two packets. 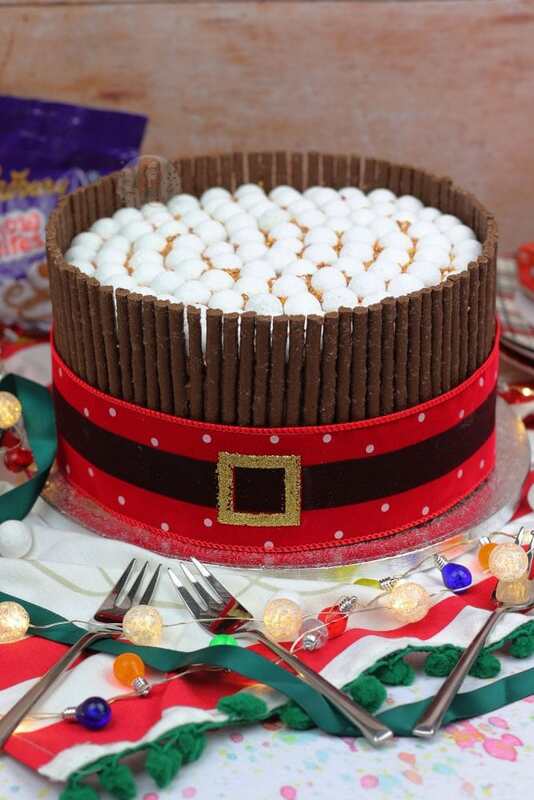 Decorate the top with your favourite Christmas sweets! The ribbon I have had for ages, but you can buy really cute Christmas bits from Iced Jems! I recommend putting the cakes in the fridge for 30 minutes before trying to decorate with buttercream on the sides as the sponge is so lovely and light it might crumble a bit if you don’t! I found the Gingerbread Matchmakers in Tesco, but they all work! The mint flavour would be delicious. I used about 5 bags of the Cadbury's Snow Bites! Newer Previous post: White Chocolate Raspberry Rolls! Lovely cake! Followed the recipe exact at it was delicious. Great feedback from all who tased it too! Hi Jane, I’m a huge fan of your chocolate cake recipe and it always gets so many compliments! I’m thinking of making this next week but decorating differently. Do you think the frosting is likely to pipe well? Lovely, thank you 😊 I’ll be sure to tag you in the end result!